He's known as the bravest man in baseball, the man who broke the color barrier in the major leagues. In 1947, Jackie Robinson made his major league debut with the Brooklyn Dodgers and became the first African American to play in the modern era of Major League Baseball. But Jackie Robinson was more than a great baseball player. He was an all-around gifted athlete, a business man, a civil rights activist and a husband and father. 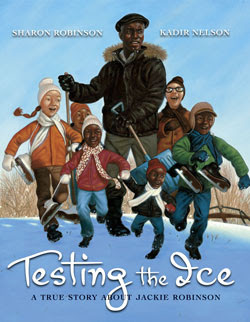 His daughter, Sharon Robinson, tells a story of his bravery on and off the field in her newly released picture book, Testing the Ice: A True Story About Jackie Robinson. A compelling storyteller, Sharon Robinson shares two ways in which her father "tested the ice," first in his baseball career and then later in a more literal manner on a small lake near their home in Connecticut. Sharon describes her father's legendary entry into the major leagues, a move that broke the color barrier and paved the way for others. She layers that historical period of time alongside a more personal one -- a touching family moment when her father tested the ice on a lake near their home, checking it for weak spots before he allowed his children and their friends to ice skate, despite his fear of water and his inability to swim. In an understated way through the use of powerful metaphor she effectively relates Robinson's strong character, his fortitude and patience, despite his fear and the obstacles he faced. Children often understand best when they have a way of relating to the subject matter. By recounting a personal event from her own childhood, Sharon Robinson draws children into the book and helps them learn a little about one of the greatest baseball players of all time and the fight to end racial injustices in our nation. Kadir Nelson's detailed, brilliant paintings sweep across the pages, perfectly capturing special moments from Robinson's memorable steal of home in the first game of the 1955 World Series to a breathtaking view of Robinson tapping on the frozen lake. Meant for children ages 7-10, the book contains a suspenseful moment and will keep their interest. Even those that are not baseball fans will find the story and illustrations awe-inspiring. NPR Story - "Jackie Robinson, 'Testing The Ice' For His Children"
In the early 1950s, legendary baseball hero Jackie Robinson literally "tested the ice" for his kids who so eagerly wanted to skate on the frozen lake near their home. Under Sharon Robinson's skillful authorship and Kadir Nelson's vivid illustrations, Testing the Ice: A True Story About Jackie Robinson also becomes a stunning metaphor for her father's remarkable racial breakthrough. Thanks to Scholastic and Big Honcho Media, Brimful Curiosities' readers can enter to win the book. 5 WINNERS! * copy of Testing the Ice: A True Story About Jackie Robinson. Four (4) additional winners will receive a copy of the book, Testing the Ice: A True Story About Jackie Robinson. • Contest ends on Monday, November 2nd, 2009 at 11:59 PM CST. Our whole family loves the stories that we know about Jackie Robinson so we would love to read more! Please enter me! away! 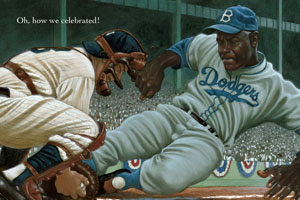 The wonderful book about Jackie Robinson would make a great combination gift for my sons! be very useful! Please enter my name in your delightful drawing. My husband and our sons are very much into baseball and its' heroes. I am an email subscriber to your site! I love biography's written for children. Would love a copy for our home library. I would love to share this book with the children I volunteer with at the local hospital. Thanks for the chance at winning it! I have always been a baseball fan. I would love to read this book to my class. This is a wonderful opportunity to win a book like this. Please enter me into this giveaway. This looks like such a great book. I would love to win! I enjoy children's books based on true things, count me in. wow this book sounds great for the grandkids!!! It is so nice to have a book based on a true story that is inspirational. This sounds like an interesting read. The only things I ever learned about Robinson were about his baseball ventures. I would love to read a little more about him, especially from his daughter's point of view. I had never heard of Robinson before now. I think my son would enjoy this. Thanks. Looks like a wonderful book that I would enjoy reading with my sons. I've heard a lot about Jackie Robinson...but never this story. I love the style of illustrations in the book. My husband loves Jackie Robinson, so he'd really like this for our son, I think! I will love reading about Jackie Robinson! My husband is a big Jackie Robinson fan so this would be a great book for him to read to our daughter. My husband would love this book...and my children, someday! My grandson would absolutely love this book! What a great story this would be. Thank you! I'm a huge baseball fan and love reading anything about the subject. We're baseball fans and love to read. Great giveaway. This book looks awesome, I'd love to share it with my family. I love kids books with a good background and meaning. My brother is the biggest baseball fan! Looks like a great read for the kids!! I love reading true stories. Sounds like a really neat book! 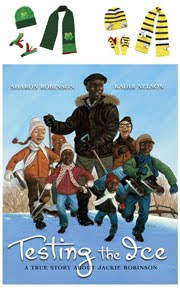 My son would love this book and I would love him to learn about jackie robinson. Thank you! My daughter would lvoe the book/ They love sports. Would LOVE the chance to win!! Always love a new book!! I follow n a tweet~!! This book sounds very interesting. I'll definitely check it out!